Listen up! There isn't much time, and if you want to look like an elephant it's going to take round-the-clock effort. We're talking stilts. We're talking a specially-formulated, high-calorie diet. It's going to be an adjustment for you, since at the moment you're merely a puny human. No offense, it's just that elephants are really, really big. And that's not styrafoam inside that lumbering grey skin, either—you're looking at tons and tons of earthshaking flesh and blood. It's going to take a while for you to get to that size, especially if you think you're already done growing. And once you are big, you'll have to get your coordination back. Those stunt elephants make it look so easy, balancing on little stools like it's the simplest thing in the world. Well it's not! 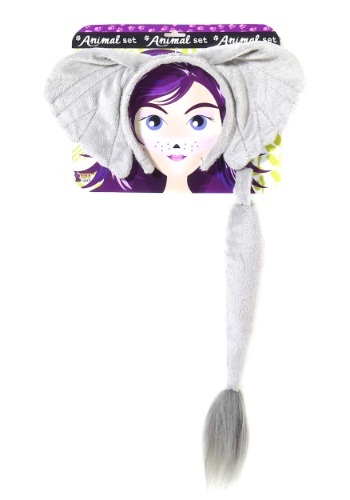 But if you want to start feeling like an elephant immediately, you can snap on a headband that comes attached to some oversized ears, like this one. Then, you can pin on a cute elephant tail to help your balance, like this one! Yeah! That's a pretty good start.